University of Maine Sterling Sheffield (6) leaves the ground to make a tackle during a 2017 home game. ORONO, Maine — Several years ago, the University of Maine defensive unit gave itself a nickname: The Black Hole. The University of New Hampshire’s offense was swallowed up by the Black Hole defense Thursday night as UMaine thumped the nationally ranked Wildcats 35-7 to snap an eight-game losing streak to the Wildcats dating back to 2011. With eight starters returning, UMaine’s defense was expected to be the strength of the team, and it certainly lived up to expectations. 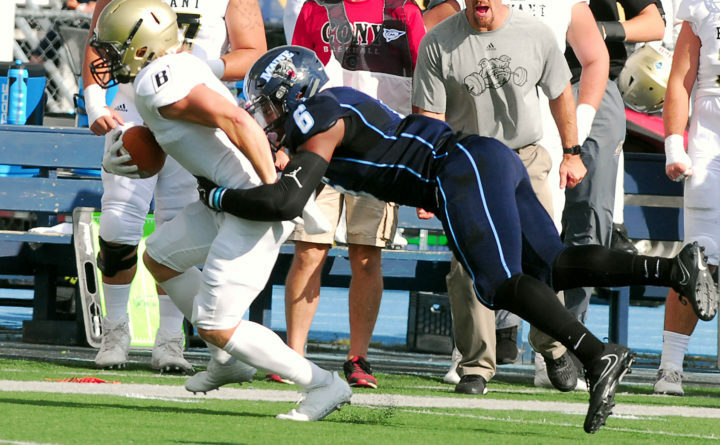 The Black Bears’ swarming defense held UNH to 116 total yards and an average of only 2.1 yards per play. UNH finished with minus-7 rushing yards on 32 attempts, although a poor snap that was recovered in the end zone for a safety went in the books as a 38-yard loss. The defense produced six sacks and dropped Colonial Athletic Association preseason Offensive Player of the Year Trevor Knight twice and limited him to 3-for-8 passing for 25 yards before he left the game in the second period with a shoulder injury. UMaine limited UNH to nine first downs and a 33 percent success rate on third down (5-for-15). Defensive coordinator Corey Hetherman, who also coaches the defensive line, developed the scheme. Senior linebacker Sterling Sheffield set the tone with two sacks of Knight in the first eight minutes. Both came on third-down plays and each resulted in a 10-yard loss. Sheffield said Maine knew UNH lacked some experience on its offensive line. “To go with that, we have a lot of great athletic players [on defense] like Charles [Mitchell], Kayon [Whitaker], Alejandro [Oregon] and Jemehl [Wiley],” Sheffield said. “We knew we had to come out aggressive and be able to attack them up front,” he added. Maine junior nose tackle Mitchell said the defense stayed disciplined. “We just worried about ourselves, not what they were doing, and it carried us through,” said Mitchell, who had a game-high 2.5 sacks among his four tackles. Linebackers Deshawn Stevens and Taji Lowe were UMaine’s leading tacklers with eight and seven, respectively, and each had two tackles for losses. Whitaker was in on five tackles including one for loss. Cornerback Manny Patterson, who led the CAA with 17 pass breakups last season, had two Thursday night in addition to four tackles. The offense did its job, too, churning out 450 total yards and averaging 6.4 yards per play including 5.2 per rush. Sophomore quarterback Chris Ferguson completed 21 of 31 passes for 199 yards and two touchdowns. Hard-running junior tailback Joe Fitzpatrick gained 76 yards on 17 carries and redshirt freshman Ramon Jefferson had 74 yards on 12 carries. Fitzpatrick capped the scoring with a 14-yard TD on which he hurdled a UNH defender. It finished off a nine-play, 55-yard drive. Harasymiak also said it was special being able to spend time before the game with several of the 18 family members of the late Darius Minor, the defensive back who collapsed and died of a rare heart condition during freshman training camp July 24. “It was great for them to see what Darius fell in love with. It was his dream, and he was living it. He will be part of this program forever. No doubt he was with us tonight,” Harasymiak said. Up next, the Black Bears visit Football Bowl Subdivision team Western Kentucky on Saturday, Sept. 8.